The Red Sox exploded for 10 runs on 16 hits as they beat the Yankees 10-4 Saturday afternoon at Fenway Park. As with Friday night's game, the Derek Jeter Love Fest continued, but this time with participation by the Yankee captain. Jeter was 1-for-2 with an infield single as the designated hitter. Boston erupted for eight runs in a 30-minute second inning to put the game out of reach. Yankees starting pitcher Masahiro Tanaka was pounded for seven runs on seven hits and a pair of walks in just 1.2 innings. 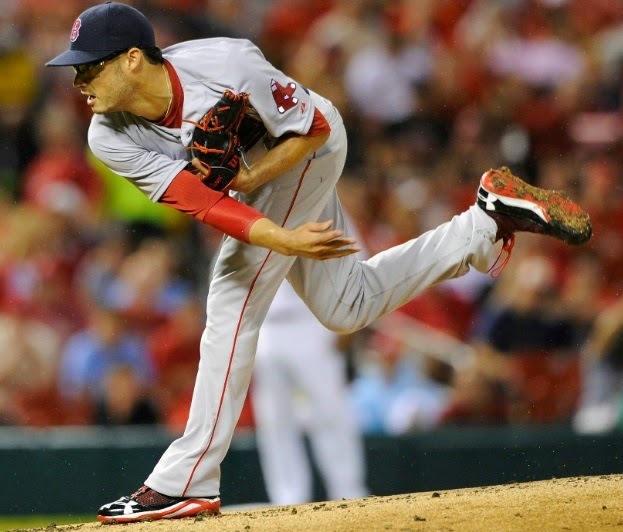 Joe Kelly (pictured) started for the Sox and went 7.1 innings in earning his sixth win of the year. Daniel Nava and Rusney Castillo led Boston with three hits apiece; Xander Bogaerts, Yoenis Cespedes, and Garin Cecchini each had two. The Sox and Yankees finish the season tomorrow afternoon at Fenway Park. Expect a grand Dr. Charles Steinberg-orchestrated celebration of Derek Jeter's career.